– Civility, Social Media Responsibility Desperately Needed. Civility, Social Media Responsibility Desperately Needed. Home » Civility, Social Media Responsibility Desperately Needed. » News » Civility, Social Media Responsibility Desperately Needed. Left to Right: Terence Shepherd, news director, WLRN News, Kety Esquivel, senior vice president of Edelman Public Relations, Travis Winslow, vice president of Ethics and Compliance at Carnival Corporation, Jennifer Valdes, president of PRSA-Miami, Fred Blevens, Ph.D., professor in the FIU Department of Journalism and Media, and moderator, Virgil Scudder. 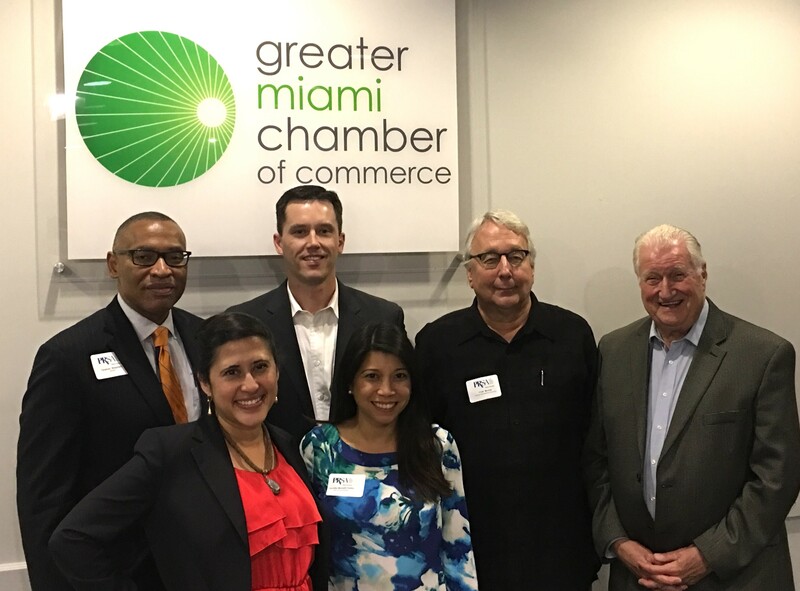 That was the message of Edelman senior vice president Kety Esquivel at a recent seminar on truth and trust in Miami. The seminar was presented by the Miami chapter of the Public Relations Society of America in collaboration with the Greater Miami Chamber of Commerce and sponsored by Carnival Corporation. Esquivel cited some disturbing statics from the most recent Edelman Trust Barometer to back up her statements. Among them: the largest ever drop in trust across institutions of government, business, media, and non-government organizations. One shocking finding of the study was that an average person’s online post, no matter how false, biased, or uninformed, is more likely to be believed than the observations of a science expert or a leader of business or government. Falsehoods, posing as truth, abound today, especially in Washington politics. The Washington Post has a slogan: Democracy Dies in Darkness.” It also dies in lies. Other speakers also pointed the finger at social media and how people use it and respond to it. Florida International University Professor Blevens, a former print journalist, specifically singled out Twitter, saying it not only disseminates biased and false statements but also statements out of context. He noted, “you can’t contextualize anything in 144 characters.” He advises his students to completely shut down their Twitter accounts, read publications like the New York Times and the Washington Post, and tune in to NPR and PBS to get facts and get them in context. Terence Shepherd, news director of NPR-affiliated WLRN Radio, also pointed to social media as a source of today’s disinformation problem. He conceded that responsible media outlets are biased but with an honorable purpose: he said they are biased toward “news, truth, accuracy, and fairness.” Social media, he declared, has long been the Achilles heel of some major media outlets, especially broadcast, as they often pass along erroneous information from social media in a rush to be first with a story. Trust and civility were also prominent topics in the seminar. Travis Winslow, vice president of ethics at Carnival Corporation stated that 27 companies paid over $2 ½-billion in fines and costs in 2016 for violations of the Foreign Corrupt Practices Act and far more in related expenses. Many people had to know about these serious law violations, he stated, but didn’t take steps to stop them. Why? Most likely, he claimed, it was a failure of trust: they didn’t trust their companies to back them up and do the right thing.